Wales or Cymru national red Welsh dragon embroidered towel that can be personalised with a name or message of your choice. 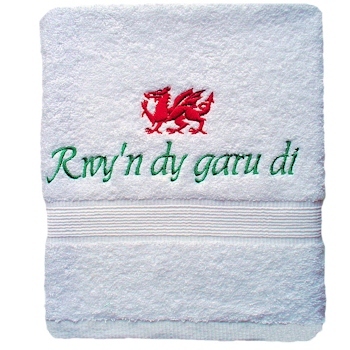 Wales or Cymru national red Welsh dragon embroidered towel that can be personalised with a name or message of your choice. We use a 100% cotton white towel. Please fill in the options with the name or message you would like personalised and your preferred thread colour for the text. Please fill in the options with the name or message you would like personalised and your preferred thread colour for the text. The national Welsh dragon symbol is sewn in traditional red colour. quality gift with your own personal touch - you or the recipient will be amazed how good a personalised towel looks.